The French classic. Chicken breasts, butterflied, then rolled with black forest ham and swiss cheese topped with a Dijon Worcestershire gravy. Oven ready, pre-heat and bake! Served with a side of baked mashed potatoes. Delicieuse! Preheat oven to 400Ã‚Â°F. Place the pan of chicken in the oven and bake for 25 to 30 minutes. Microwave your gravy until warm and drizzle on chicken. Serve with baked mashed potatoes. The flavors are awesome and we love the mashed potatoes. SUPER EASY dinner. We now order twice a week and it is such a nice feeling to come home and have a meal ready to cook. Cannot say enough about the quality of this meal. It was easy to prepare and tasted so great. Very tender and tasty.Will definitely order this again. This was my first meal from Maria's Gourmet Kitchen and it was delicious! All I had to do was put them in the oven and bake. The chicken was moist and flavorful and the baked mashed potatoes were the best I've ever had! This dinner was delicious & all I had to do was put them in the oven to bake & then I enjoyed!! A fantastic meal. 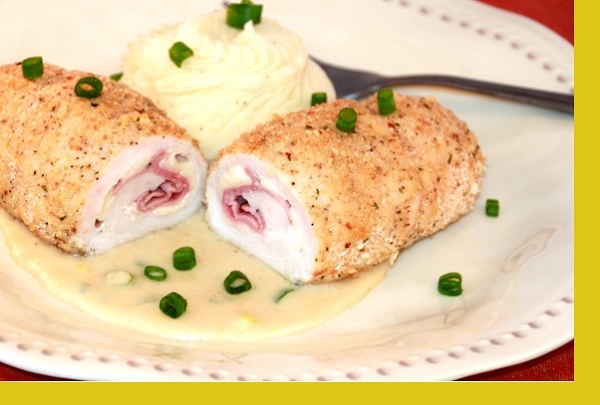 It is a Gourmet dinner ready to eat in 30 minutes! My wife and I love it. We are regular customer to Maria's Gourmet Kitchen, and we never miss this meal! This is by far our FAVORITE! We could eat this every night and never get tired of it! This dish was absolutely our favorite. I even forgot to put the sauce on, but, it didn't matter. It was so flavorful and the potatoes were yummy. We rarely eat potatoes so this was a treat. I will definitely order it again, and again, and again.I think we liked it!! We have enjoyed everything we've ordered thus far. 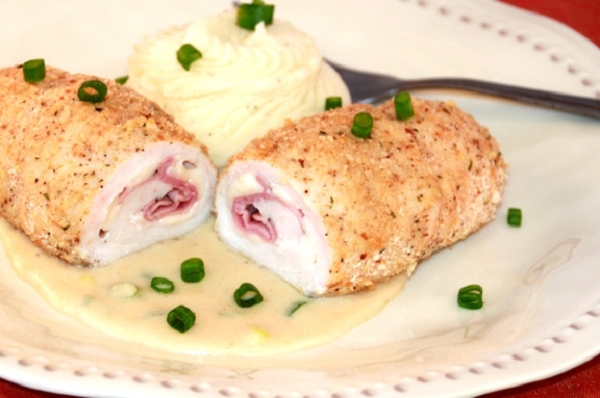 Maria's Chicken Cordon Bleu is great! It is very easy to prepare and so delicious. Love the sauce. The mashed potatoes are really creamy and delicious as well. Presented perfectly and really delicious. Very lightly coated with crumbs, baked beautifully. Sauce was delicious. New favorite! My husband thought it was great. It was very easy to prepare which is super important to me. Thank you for helping us make an otherwise hectic day end on a good note! This week was the second time we've had this meal. The potatoes were so much better than the first time because there was less bread on top and on the bottom. They were very good today. The chicken dish is really excellent, but has a little too much salt, maybe from the sauce. We will order again. Her sauce is on point! So delicious. Chicken was so moist. This Was Over The Top Good!!! This was a superb meal!!! and easy! The combination of flavors in the chicken with the mashed potatoes and gravy was to die for. My husband went crazy for this!A definite to do again and especially for company!! Oh my goodness! This was SO delicious!! I LOVED this meal. The chicken was so flavorful, and the gravy was over the top yummy. Everything was so easy to make - just pop it in the oven! I can't wait to have this dish pop back up on the schedule. You could tell everything was incredibly fresh, and high quality. Don't know what we do without Maria!